DLSU-M faculty members, Prof. Andres Winston Oreta, Assoc. Prof. Danilo Terante and Assoc. 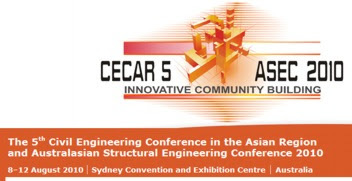 Prof. Alexis Fillone and Lasallian alumni (COE Graduate Studies) will present papers at the 5th Civil Engineering Conference in the Asian Resion (CECAR 5) which will be held on August 8-12, 2010 at the Sydney Convention and Exhibition Centre, Australia. The theme for the Conference is Innovative Community Building. This conference will be an "opportunity to discuss innovative civil and structural engineering projects and to network with colleagues". It will also "provide engineers with the opportunity to hear presentations from academia and industry leaders on their visions for building enhancement in the community." (1) Seismic Risk Mapping at Microscale: The Case of Brgy. Carmen, CDO, Phils. (2) Rapid Visual Screening of Buildings in the City of Manila, Phils.